ST. GEORGE – An auto-motorcycle collision at the intersection of Riverside Drive and 270 East Thursday evening resulted in a partially blocked roadway and one man going to the hospital. Around 6 p.m., the driver of a Toyota Prius had stopped at the traffic light in the eastbound lane at the intersection when the car was hit from behind by a motorcyclist, St. George Sgt. Jared Parry said. The impact caused the Prius to drift over into another lane while another car came along and ran over the leg of the motorcycle rider, Parry said, adding he was not sure if the rider was wearing a helmet at the time of the collision. The southbound turn onto 270 East from Riverside Drive was blocked while police, firefighters and medics responded to the scene. 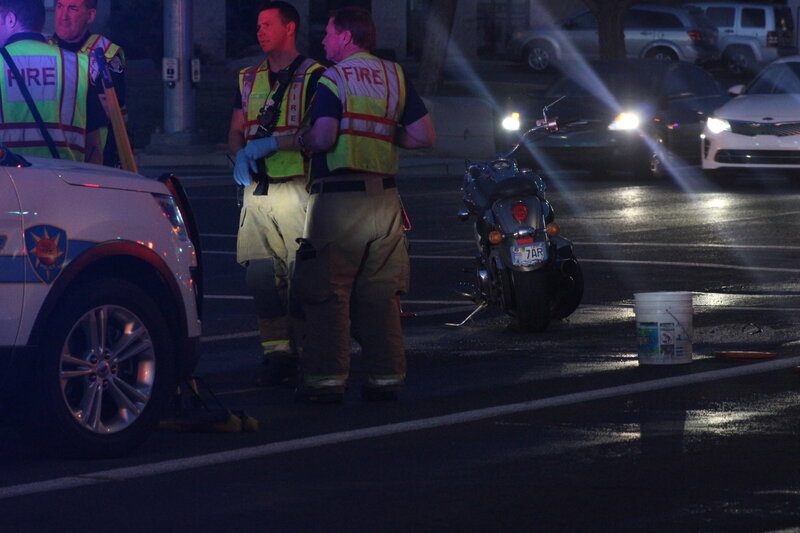 The motorcycle rider was examined by Gold Cross Ambulance medics at the scene and was taken to Dixie Regional Medical Center in a private vehicle. While the scene was cleared by 6:50 p.m., the incident was still under investigation and no citations were issued at the time.